Sipadan is Malaysia’s only oceanic island and it is actually a massive extinct volcano cone. Coral has grown from the volcanic rock mountain which lays dormant and almost totally submerged in the Celebes Sea. Located just off the north eastern coast of Borneo, Sipadan has long been a scuba diving mecca. When we were travelling in the area (July, 2009), we heard other divers speak of this tiny island as if it was the holy grail of marine ecosystems. Over 3,000 species of fish inhabit this tiny atoll and they are accompanied by hundreds of green and hawksbill turtles, as well as barracuda, jack fish, hammer head sharks, whale sharks and more. This was definitely a place I had to see! We planned our trip to Borneo, one of the most beautiful islands in the world, and excitedly booked our flights online. There are a limited number of flights to this island, so we searched different airlines for the best deal. We typically find AirAsia to be the cheapest, but by using Expedia, we were able to lock in a seat sale and we flew from Kuala Lumpur, Malaysia to jungle-clad Borneo for less than $40! The conditions in July were absolutely perfect for a great week of diving. We arrived in the Northeastern town of Semporna after a long bus ride from Kota Kinabalu. We found a small, basic hotel, checked in and promptly passed out. The next morning I awoke early and headed to the dive shop where I suited up and prepared myself for my first 2 dives. As I boarded the dive boat, I couldn’t help but to by hypnotized by the brilliantly clear waters of the Semporna Marine Park. As the sun rose higher in the sky, it illuminated the powdery white sand below our boat and the entire sea took on an effervescent glow. “If we don’t see 20 turtles I’ll be surprised”. I laughed and thought for sure he was exaggerating. Suited Up & Ready! 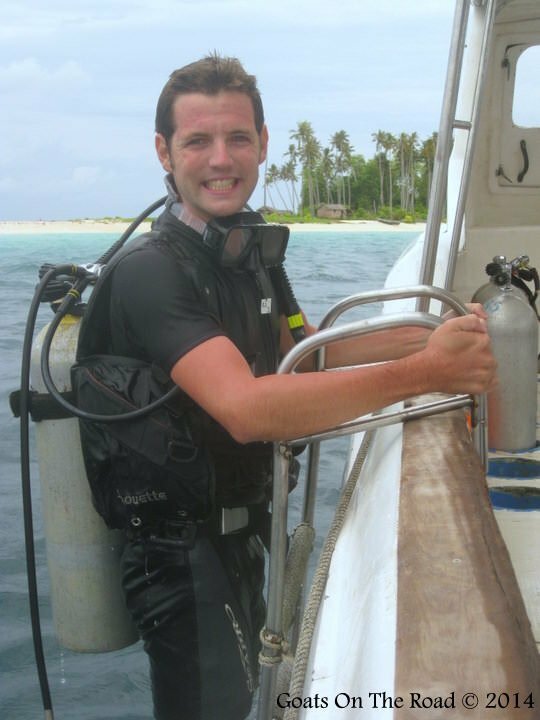 A Much Younger Me, Excited to dive Sipadan. I was ecstatic as I donned my tank, mask and fins. We all sat on the edge of the boat and one by one we dropped backwards, our splashes shattering the otherwise glass-like emerald waters. As soon as the bubbles from my entry cleared around me, I realized that we were all in the middle of a massive tornado. The swirling mass spiralled around us in every direction and downward as far as the eye could see. The twister was made entirely of jack fish, some reaching 4 feet long! The excited fish were so densely clustered that we couldn’t see the waters beyond their silvery cyclone. Finally the whirlwind dissipated and we could see the edge of Sipadan Island. Richard signaled for us to continue and we all swam slowly, single file at a depth of about 30 meters. We followed Richard along the massive coral wall which plunged to a depth of nearly 600 meters below us. The visibility was so good that I could spot reef sharks circling their prey some 40 meters below. The coral embankment on my left was so brightly coloured that it looked surreal. Brilliant blue and red fan corals gently waved back and forth in the transparent sea. Every 10 meters or so we passed different caves that seemed to be dug out of the wall. Inside of nearly every cave there was a turtle. Richard jokingly began counting turtles with his fingers and by the time we finished our third dive, I think he lost count at around 30. Every dive at Sipadan was the best dive of my life. I swam with reef sharks and eagle rays. I laid next to nurse sharks and turtles as they slept in small reef caves. I spotted an octupus, sting rays and so many other fish that it would be impossible to list each species here. The marine life at Sipadan was so abundant that it seemed as if all of the fish from the nearby reefs came to meet at this one coral atoll, leaving the other seas barren and empty. Why so many species of fish, turtle and coral congregate here is a mystery, but it makes for a truly memorable dive. Dariece met me at shore and she could tell by the massive grin on my face that I had an amazing day of scuba diving. I struggled to recall all that I had seen as I excitedly explained the dives to her. Richard laughed and patted me on the back “I told you we’d see turtles” he said proudly. But in truth, the turtles were only a small part of what made Sipadan so spectacular. The sheer diversity of the sea life, the colour of the corals and the clarity of the water made Sipadan the most unforgettable dive of my scuba career. Since then, I have dove in The Red Sea, Egypt, seen Humpback Whales on scuba in Tofu, Mozambique, been cave diving in Cenotes in Mexico, and visited spectacular reefs in Belize, but none of them compare to the wonder that is Sipadan. I hope one day I can return to this underwater dreamland which will probably remain for me, the best dive site on Earth! 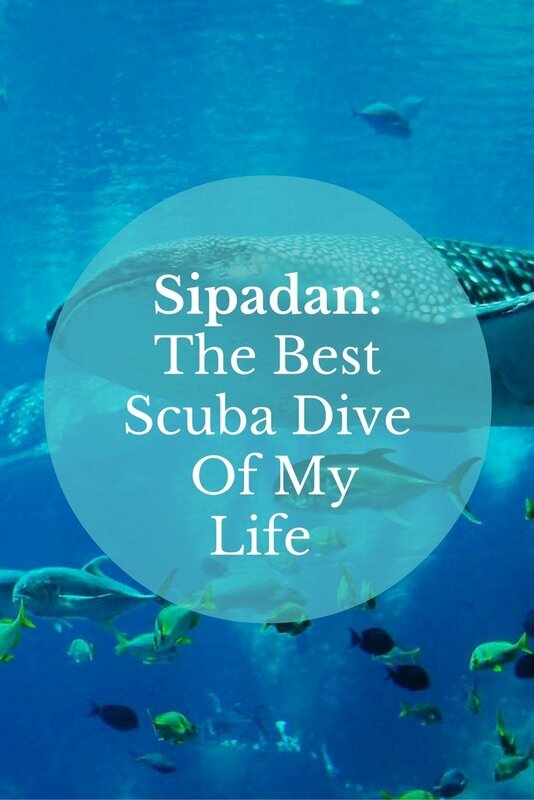 We’ve long been dreaming of diving in Sipadan. The clear waters and colorful inhabitants look just superb! Definitely get there if you can! This was my favourite dive site by far. The diving around Indo is fantastic as well! Nick dove near Gili T and loved it. We would definitely like to come back to Indonesia one day soon. I LOVED Sipidan, too! We were really happy with our decision to dive with Scuba Junkie. We did a lot of research and glad we did. SJ definitely puts a lot of work into the local community in various ways – spay and neuter programs, a turtle hatchery, beach clean-ups, the list goes on and on. We walked around Mabul Island and it just didn’t seem like other resorts were ”on board” with this mission – especially from all the burning of trash and piles of garage surrounding the pricey resorts! It makes me sick just thinking of it. After 10 years of diving, my scuba skills improved exponentially while in Mabul and Sipidan diving with Scuba Junkie. Awesome that you dove Sipadan as well! Thanks for adding this information about Scuba Junkie, it’s helpful for others who are thinking of diving off of this pristine island. Reading your story brings back great memories. It was ridiculously awesome there. 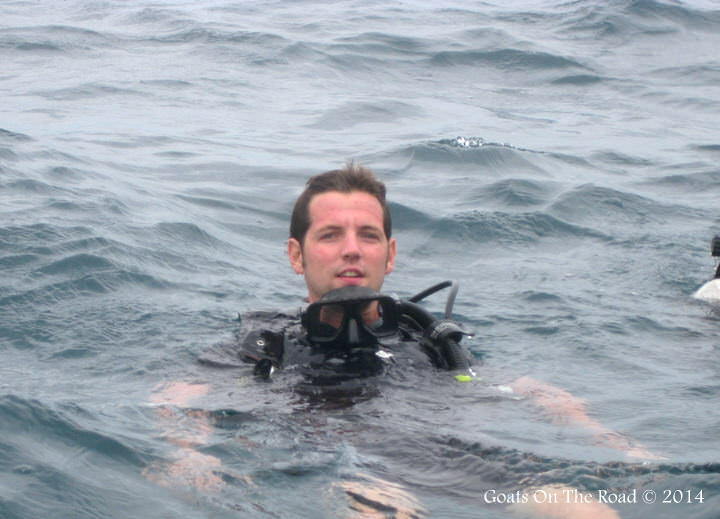 Great article, always love to hear about scuba diving adventures. I am planning on diving Sipidan in November and was wondering what you think is the best option to get there from Thailand? Did you book your diving in advance? My BF does not dive, will there be things he can do during the day while I am diving? That’s great that you’re going diving on and around Sipadan! I was able to come out on the boat for all of the dives that Nick did (except for the one that was actually in the Sipadan marine park) I got to snorkel and enjoy the islands as well! The one day that I did stay back, I just explored the small town, no there’s not a whole lot to do. From Kota Kinabalu, it’s a couple of hour bus ride to Semporna. Yes, you have to sort your dives in advance as only a certain amount of people are allowed to dive there/day. Thank you to share your experience with us ! Malaysia is a great place for diving ! But if you like it, you should try diving in Thailand, I sure that you will love it ! You’ll enjoy the Philippines as well 🙂 I haven’t heard any recent news on the area around Sipadan, but it’s definitely important to check advisories before you head there. You could post a question on the Lonely Planet Thorntree and see if anyone has been there recently? So how many turtle have you seen? Did you count? Did you guys make it out to Komodo for some diving?? I was lucky enough to hit up Sipadan first and then Komodo for my DMT. Sipadan was the best diving I’ve done too. Imagine diving Sipadan quality reefs if not better all day every day and then add in dozens of mantas swimming around you and that’s komodo!